Jiaur Rahman born in 1979 in west bengal, india, earned his Bachelor's degree in Visual Arts from the Government College of Art and Craft, Kolkata, in 2003. Rahman's watercolours are delightful renderings of nature, with the aim of capturing a single moment for eternity. The artist has a close association with rural Bengal, and desires to immortalize the beauty of its fast changing landscape. Not one to be bound to the rural surroundings, Rahman has also captured the cityscape in his works, aiming to portray scenes that are characteristic of Kolkata. 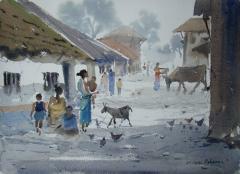 Rahman's watercolours are misty, almost rain-washed, and have an endearing quality. 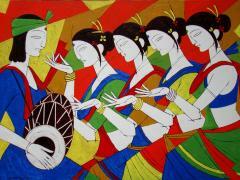 Also he makes figurative paintings depicting the tribal and rural culture of Bengal using bright and vibrant acrylic paints. Jiaur Rahman had his first solo exhibition in Ahmedabad in 2001. 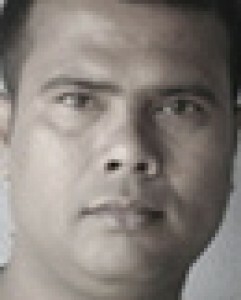 Since then, he has had seven solo shows, the most recent being at the Indiaart Gallery, Pune, in 2007. His works have been featured in several group shows, including those held at Mystiq Art Gallery and India Habitat Centre, New Delhi, in 2008; and at Epicentre, Gurgaon, also in 2008. Rahman has also participated in Thailand and Indoneshia in South-East Asia and in a number of shows organized by the Lalit Kala Akademi, the Birla Academy of Arts, the All India Fine Arts and Craft Society (AIFACS) and the West Bengal State Academy. He has won some prestigious awards like in 2002 he received the Camlin Art Foundation Award, Kolkata, and in 2001, the Nokia Asia Pacific International Arts Award, New Delhi. At such a young age, Jiaur Rahman has received recognition and appreciation for excellence in art and creativity, and has achieved respect and pride for our country on an international level. Private Collections of various Art Collectors, Artists, Art Galleries, Corporates In All Over India And United State of America, United Kingdom, United Arab Emirates, Singapore, Malaysia, New Zeeland, Switzerland, Austria, Mozambique, Oman and many other countries.